A couple weeks ago I shared another scrappy pillow that I made with my Island Batik fabrics and the cute little labels that come with some of their fabrics. This month all of the ambassadors for Island Batik are sharing pillow projects and I couldn’t resist doing a second one. I don’t know about you but pillows are one of my favorite things to make. I used my AccuQuilt GO! 6 inch Mix & Match Qube set to cut out the pieces for my Scrappy Batik pillow. There is a die that cuts out four HST triangles at a time for the Square on Point die. The Square on Point die is also part of the AccuQuilt GO! 6 inch Mix & Match Qube set. The little 9 patch squares were made using 1½” squares in bright batiks that I cut from all of my scraps. I also cut 1 ½” squares of leftover neutrals that I had. I made 13 of the 3½” Square on Point blocks and 12 of the 3½” 9 patch blocks. The pillow wasn’t quite the size that I wanted so I added a 3 inch border. The scrappy batik pillow ended up being a 20″ square. I used Aurfil 40wt thread for my quilting and did a simple meandering and then some long loops on the border. I think I have mentioned that I have started using the Aurifil 40wt thread and really, really like it! It was fun to take the pillow outside on the deck for photos. I mentioned that this was a scrappy batik pillow, I didn’t have enough of the neutral for the back of the pillow and had used all of the blue 5 inch strip for the Square on Point blocks. I dug through my Island Batik stash and found a blue that I had used for the back of a quilt that I made last year. The leftover batik wasn’t large enough for the back so I just pieced it together. No one will notice! I use affiliate links. At no additional cost to you, when you make a purchase I may get a small commission. Your support is very appreciated. 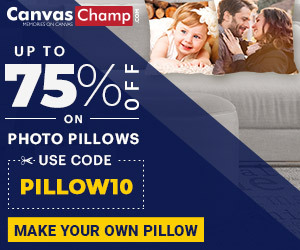 Thank you!How about making a photo pillow! That would be fun! The pillow is great. I like the blue feature fabric. Connie, it’s a beautiful pillow! Such a cute pillow! Of course you used the 1″ squares!!! I thought it was funny that there’s spaces between the squares…but I love tiny!! Cute pillow! I love the bright colors paired with white. I love it, so colorful and fun! I absolutely LOVE this pillow. It’s so bright and cheery. I may have to try making one similar and have plenty of bright, happy scraps to work with. Thanks for sharing! That looks really nice. I like the alternating 9 patches with the square in a square. It came out really pretty! What fresh looking colours. And pillows are one of my favourite things to sew too. 🙂 Pinned. This is a super cute pillow. I love the pattern. Such a great way to use up those scraps!